PDF Impress supports custom paper sizes up to 129 inches, but some paper sizes may need to be added manually in order to appear in the paper size list in PDF Impress. Microsoft operating system, Windows 8, requires a few different steps than older versions. Read more to find out how. Go to Settings, then Control Panel, and finally View devices and printers. Click a printer in the list (e.g. 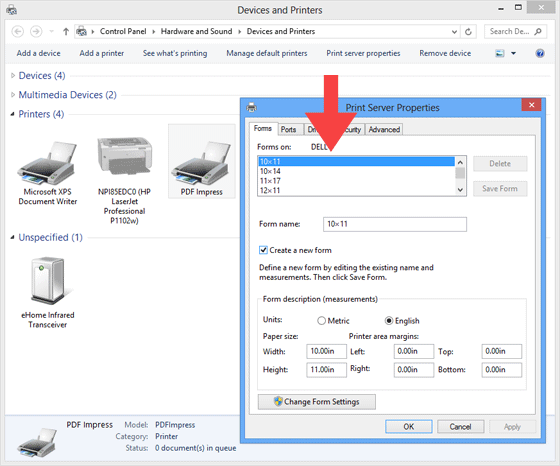 PDF Impress), then click Print server properties. In the dialog box that appears, check the box for Create a new form. Give the new page size a unique and descriptive Form name, such as ’24×36′ or ‘Custom A size’. Select Metric or English units as required. Define the page size with the long dimension as the width and the short dimension as the height. Click the Save Form button. The new sizes should now appear in the page size selector in the Printing Preferences task in PDF Impress Profiles and Watchers. If it does not appear, then it is it too large or too small to be printed by PDF Impress. Learn more about PDF Impress and download trial here.